During my recent stay in London (which was an amazing experience btw.) one thing I couldn’t oversee was the high concentration of wealth and luxury everywhere I looked. But when I thought about it for a moment, I realised that when you have so many mega-rich individuals living there, one has to find a way for them to spend more, and provide them with options to diversify themselves and stand-out among each other, simply because there “has to be a difference” between multi-billionaires and billionaires. This usually ends up with real-estate, art, vehicles, brands and stuff becoming so ridiculously overpriced, that at some point their price greatly surpasses their value. I mean, I can relate with the fact that when there is demand, prices go up. But I simply can’t relate with the fact how some items when priced 100x their value sell even better than if the same store priced them at 10x their original value. Are we as a society so shallow and vain we aren’t able to see pass this? I was just wondering at which point all this collapses, because it surely can’t grow indefinitely… Best example I can give you is how often junk and crap passes as “abstract” or “concept-art“, selling for millions just because it can. Next Human Motorcycles are HOT! This is an excellent variant on “color negative” images! It’s not your weird brain, it’s your eyes. The image burns itself into the light receptors in your eyes and when the colors vanish, your eyes over compensate. Man, was that a joke? the only thing the eyes do is receiving the light to transform his energy into nerve impulses. Those gets “translated” in the brain (and brain only) in the process we know as viewing. Is the brain the one trying to compensate an excess of a certain unique kind of information, in the case about light wave frequencies, to not get tired of it. If you look at the black and white image then look away you can’t see colour but if you look back just after a second at try really hard to visualize the colours, you actually see them! I really like this one; it made me smile! Dont we just love that effect! I wasn’t sure what I was seeing at first. But I loved it. How brilliant is our brain? I love color negative optical illusions. While I absolutely agree on the point you just made, could you please keep your opinions to yourself? I am sure you would make a great philosopher or whatever, but please open your own blog or something. I enter here expecting optical illusions and the explanations behind them. Usually you would just write a small paragraph explaining the illusion while ‘announcing’ how you changed the background of the page and added some features or something – but when ALL of the post is dedicated to explaining some random stance of yours while you just leave a random picture for your rant to be a valid entry, you should just know you crossed the line beyond any reasoanble point. 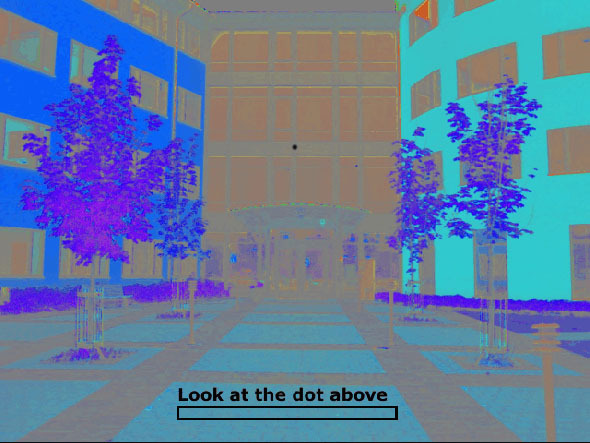 I know this kind of illusions is pretty damn old and you have explained the magic of our retina countless of times – and, hell, the .gif even instructs us what to do so we can see the ‘illusion’ in case we are new and are oblivious to this stuff; it still isn’t enough of an excuse for you to freely rant at completely random and unrelated stuff while saying NOTHING whatsoever about the illusion! Although I somehow agree that don’t introducing the illusion featured in the page AT ALL is a bit too much, considering the amount of interesting and funny hours I spent with this blog I’ll forgive such a behaviour not just once, but many times. Interesting in that I expected to see the colors everyone is talking about, but all I see when it switches to black and white….is black and white. Wonder why? Try getting close to the image so it fits most of your viewing range, if still doesn’t work the explanations could be that your brain doesn’t get tired easily (i explained basicaly some coments avobe how this process work and i’m lazy enough to do it again) try watching longer, or you are compensating already becouse there’s lot of red things around your monitor-room. If not i’d recomend to consult a neurologist; if you VERY OFTEN feel you brain getting easily tired, cefaleas and stuff this could be the cause..
ive seen one like this before somewhere else, only it was a rainbow with a waterfall!! !, TWAS AMAZING BUT THIS IS COOLER!!!!!! very nice! Below I’ve copied and pasted Andym’s message to John who wondered why he couldn’t see the illusion.